Enjoy your Veranda extension at any time of year. This unique offering from Ultraframe will turn heads when friends or family come to visit. Contact us for advice and a free quote. Are Verandas On Your House Extension Radar? Our Verandas are manufactured by Ultraframe, the industry leader of conservatory roof systems. The unique designs of these Verandas will reward you with a multifunctional space that can be used throughout the year. What makes an Ultraframe’s Veranda so appealing? Perhaps it’s the strength of its aluminium beam, which doubles up as a gutter. Or maybe it’s the oversails in its roof that create an additional space to spend time in. With subtle choices of supporting walls, the Veranda Glazed Extension offers a true cross over between a conservatory and extension where the interior flows beautifully into the outdoors. Fox Windows understands Verandas. We have already installed this product for customers in Kenilworth, Leamington Spa, Warwickshire and the surrounding area. Find out more by contacting our team today or get a free online quote. 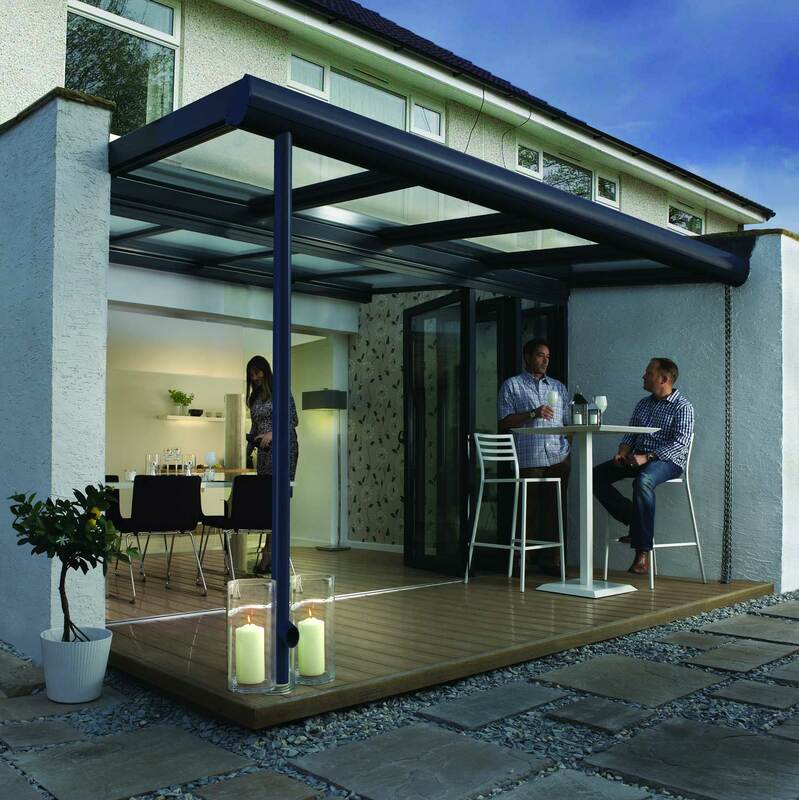 With the Ultraframe Veranda, you’ll benefit from two spaces in one. Oversails in the conservatory roof create a sheltered pockets that can be used when its raining. You’ll be able to sit and enjoy views of your garden, whatever the weather. Internally, you’ll be able to enjoy a comfortable room that’s a natural extension of your home. What Sort Of Wall Would You Prefer? The more you explore our Veranda extension,the more you’ll begin to appreciate its flexibility of design, Two types of supporting wall can be used with this roof system - masonry or glazed. Whether you prefer privacy or want to let in lots of light, you’ll be able to find a solution that addresses your home improvement requirements. The unique design of your Veranda extension will stand out. You’ll be able to ensure maximum impact by selecting a coloured foil that ties in with your chosen colour schemes. It’s possible to choose different shades internally and externally to ensure a perfect match, The hues that we use won’t fade or flake away over time either. Create stunning views of the outside using the structural goal post, a feature that will remain hidden from view - while allowing for wider spans. You’ll be able to include bi-fold or patio doors in your house extension plans, which means your new room will always be filled with light and can be kept well-ventilated during the warmer months. The Veranda extension works with Gable and lean-to building shapes. The latter will be of particular interest to homeowners living in terraced homes or bungalows, as this style fits under the eaves and is square or rectangular - meaning no square inch is spared. This means you’ll be able to make the most of the space you have. The Veranda comprises a strong aluminium beam that doubles-up as a gutter and provides support. The underpinning strength is delivered by two types of post. The Oak option boasts stop ends and uses a stop plate to join at the base. The aluminium version works as a drainpipe and structural goal post to deliver wide spans. The refreshing pergola style design of your new room means that it will keep you connected to the outside all year round. During warmer weather you can throw your doors wide open, so that guests can mingle in the garden. When it’s colder, you can enjoy a drink with friends or family while sheltered under the oversails. Our roof system is strong and will retain its eye-catching appearance for a long time. If you decide to sell your home, your unique looking house extension will turn heads. And, because it’s a multi-functional space, prospective vendors will recognise its design potential. You’ll be making an investment when you choose the Veranda. Although the Veranda is stand-alone product that’s packed with a range of unique benefits, it uses the Classic Roof as the basis for its design. This means that the technology used to build your new room has been proven to work. Find out why customers in Kenilworth and Leamington Spa are choosing this system to extend their home. Fox windows installs a wide range of house extensions, including the Veranda roof. We have met in full the requirements of the Ultra Installer scheme, which is managed by Ultraframe. Our business also meets the criteria of the Which? Trusted Trader scheme. Our experience and accreditations make us the right partner to help you. Take a closer look at our stunning Veranda and get a competitive online quote in just a few minutes. Contact us for advice or prices or use our design tool to build your product online and get a quote in minutes. Explore our conservatories, house extensions and orangeries using our stunning VR tool – without setting a foot outside. Transform your home and create a stunning new area to enjoy with our range of Verandas – perfect for homes in Kenilworth, Leamington Spa, Warwickshire and the surrounding areas.